Trying to log in to this SMTP account failed. Verify the username and password are correct. 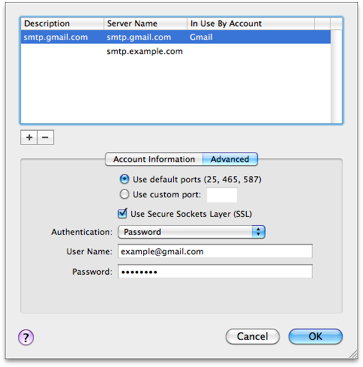 Service providers have very specific settings needed to connect to their SMTP (outgoing) email server. Most of the time this error specifically means the username and/or password for your SMTP server are incorrect. For some providers, usernames and passwords are NOT required to connect to the SMTP server. You will need to check your providers support site for exact settings. Select the account from the left column that Connection Doctor displayed the error for. Under the Account Information tab on the right, look at the bottom of the page for Outgoing Mail Server (SMTP). Click on the drop down menu on the right with the server name on it and select "Edit SMTP Server List"
The active server will have a check mark (√) next to it's name. When the SMTP server information pane appears, ensure the Advanced tab is selected. From here you can see the key settings. From here ensure your username and password are correct. Re-enter your password if in doubt. Also double check to ensure the Authentication is set to "Password". It's extremely rare to see any of the other authentication types (besides Password and None) in use. When complete hit OK to save and close the pane. From here ensure the Authentication is set to "None".